Why Change Career Path To Vet Assistant? Read This! As animal lovers, we’ve probably all wondered at one point how our lives would be if we could make a living out of caring for our furry friends. It sounds like a dream job; but the way leading to a career as a vet or a veterinary technician can be long and difficult. Still, that doesn’t mean you should give up on your dream of being part of the healing process of innocent souls—you can start putting some thought into becoming a vet assistant, which currently happens to be a job in high demand! Most tasks regarding animal healthcare require long years of undergraduate and postgraduate studies, but a good applicant with a high school (or high school equivalency) diploma can be eligible for a vet assistant career. Some previous experience with animals would surely be a plus, but the right mindset and willingness to learn may suffice to earn you a job in this field. Most veterinary clinics are open to suitable candidates to train them on the job, while practicing basic responsibilities like feeding, bathing and exercising the animals, as well as keeping an eye on the hygiene and sterilization of the examination and operating rooms. 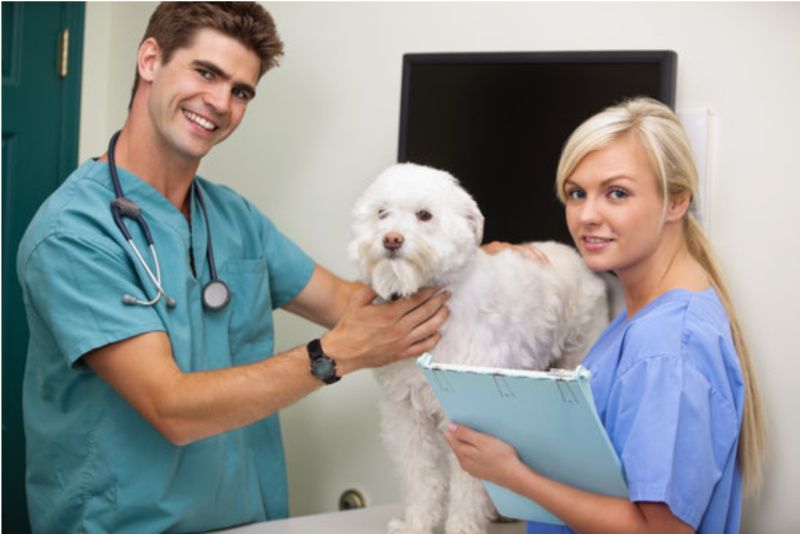 If you prove to be a skillful and responsible vet assistant, you may professionally improve yourself and climb the career ladder after gaining some experience. You can participate in courses, obtain diplomas and certificates, and end up taking on more technical tasks such as drawing blood, collecting samples, doing lab work, administering medicines and vaccinations. This might lead to a vet technician career one day, or if you believe you’ve found your calling, you may even enroll in a veterinary faculty. In 2017, the median income for vet assistants in the US was announced to be $26,140, reaching up to $38,300 for the top ten percent in the field. While this income is lower than that of vet technicians, it might be more than reasonable for you due to the little training and past experience it requires. Of course, the exact amount of money you’ll make will depend on the clinic or hospital you’ll be working on, and on the standards of your city or country; but once again, there’s always the possibility to get better at what you do. If you decide to advance your career and pursue a future as a tech assistant, your yearly salary can increase up to around $50,000. Patience and perseverance are essential to any career in health care—this is especially true when you have to deal with injured or frightened pets on a daily basis. Your responsibilities as a vet assistant include the ability to be a good listener and observer, to communicate effectively with other people; in addition to adapting to emergencies and solving some unforeseen problems. It involves a great amount of teamwork and may require your presence at the clinic during night shifts or holidays. The risk of personal injuries or illnesses is also a point to consider; but if you believe that you have the necessary skills and ambition, this career switch can provide you with an active job that will teach you a lot. At the end of the day, you can really end up making a difference, changing the lives of hundreds of pets—as well as their loving owners—for the better. As is the case with any big decision in life, it’s important to know, in advance, the pros and cons of pursuing a vet assistant career. You can contact people who have been through the same path before, do some research online, then analyze your own skills and aspirations before you reach a conclusion. Once you decide that helping a trained veterinarian or vet technician handle animals is what you want to do in life, you can actively start looking for job opportunities around you and get prepared to take the first step.